Here’s a watch I’ve been itching to get my hands on for a long time: A Ernest Borel Cocktail Watch. 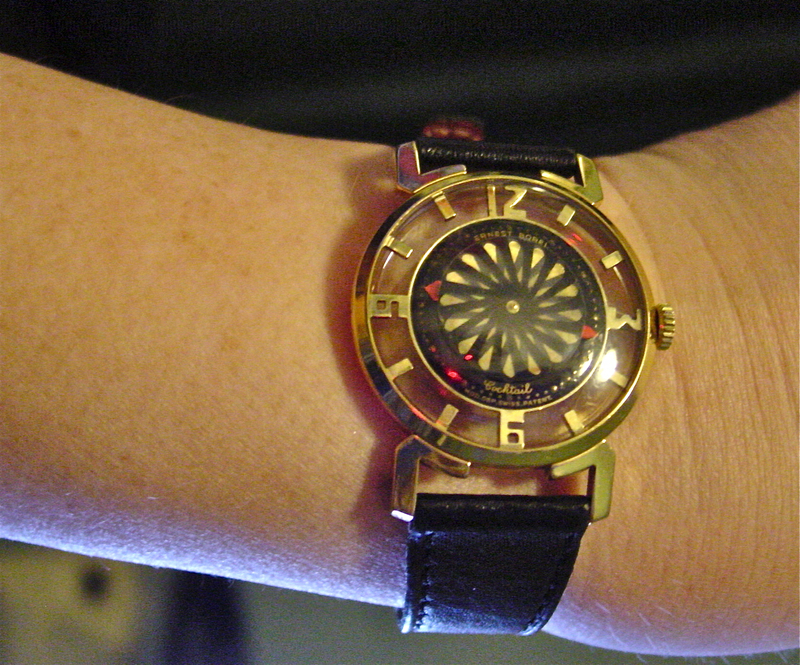 These crazy, hypnotic watches were first introduced in 1953. The Cocktails come in five different patterns on the rotating, transparent kaleidoscope discs: flower, sun, arrows, star, wheel. This dial is the flower. It’s in pretty awesome shape. And look! It has a display caseback so you can get hypnotized by the movement! 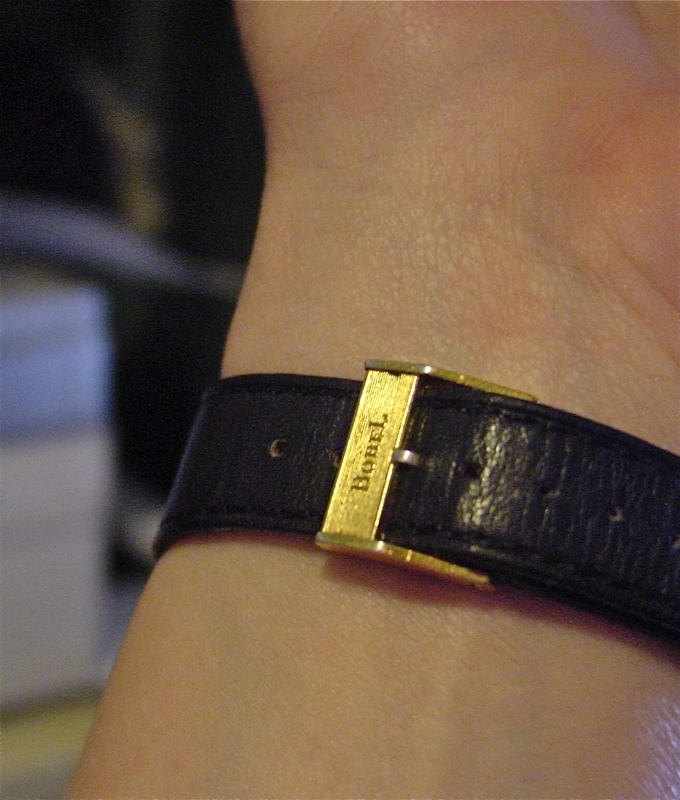 It also has its original clasp. for years! a gift in the 60’s from grandparents..
can it be easily serviced ? I am in so cal. what’s it worth? Lots of things affect the value. For example if it is mint in its original box with sales receipt, etc. it will be worth a lot more than if it’s not working. A quick way to get a ballpark valuation is to go to eBay and see what similar timepieces are going for. If you have an eBay account, you can search completed auctions. Good luck! I have an Ernest Borel Cocktail Watch that my father left me. Recently I had some minor repairs and cleaning done by a reptable watch shop. In researching the watch, almost all said that the the kaleidoscope disc rotated. Mine does not and the man who repaired it said that this model does not. My question: are there models where the kaleidoscope disc did not rotate? As far as I know, the disc turns on all models — that’s what gives the kalaidescope effect. There are Borel watches that don’t have the disc at all, But if yours has one it should turn. Hi, I don’t know to whom I should trust my Borel, Cocktail watch for repairs. My dad gave me this Borel watch in 1958, as a graduation present. It needed service once and I gave it to a local watch repairman who, I think, did an OK job. That was last year. Now, it stopped again so I question the choice of repairman. I don’t want to lose this one as it comes with some great memories. The back has a see though glass. The movement says Synchron 26, 17 jewels. The front says, Modele Depose COCKTAIL Swiss Patent. Can you advise how to choose a repair person? Your watch sounds very similar to mine! 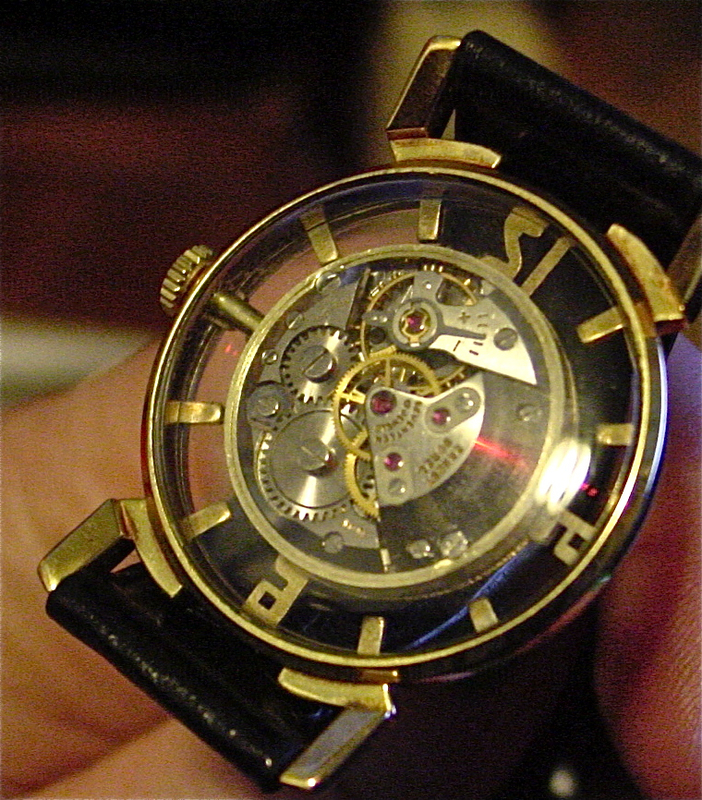 To help find a good repairman, I suggest going to Timezone.com, visiting the vintage watch forum and asking if anyone could recommend a watchmaker in your area. I found my watchmaker through trial and error, but you don’t want to experiment with such a sentimental piece. Oh Man… where can i find one of these babies in good shape? I found one on ebay, but the seller won’t ship to Canada and I can’t even send him a message to try to convince him. My father gave me one exactly like this one back in the early to mid 60’s & it was stolen in the 80’s. I would love to find another one. I know I wil never get mine back, but if I could get one exactly the same as this one… I would be a very happy camper! Anyone want to sell theirs…? I’d say keep searching eBay. I received a Borel Cocktail Watch for my High School graduation on 1968. It was stolen in a burglary three years later. I have been looking for one to replace it. I wish I could find an authorized dealer where I can purchase.